Looking over the placid waters of our noble harbour on asummer’s morning in 1914, my gaze was focussed on the magnificent Cunarder 'Mauretania' as she gracefully and almost silently glided out to sea for New York with her thousand or two thousand passengers, and instantly the thought arose abidden - ”What of the Sirius” the shattered wreck of which lies in Ballycotton Bay. Full many a fathom deep,” a few miles or so on the port side of the departing liner, and what of her gallant captain, whose bones lie whitening in the caverns of the deep, in the broad Atlantic, perhaps aye thousand miles from the remains of the steamship which he so successfully navigated for the first time in maritime history from our old city by the Lee to the land of the Stars and Stripes, where so many of our people have found a new home. As I will show later on Lieutenant Roberts subsequently commanded the 'President' and was lost in her with all hands. It is a curious fact that the result of the latter statement was the immediate cause of sending the „Sirius”across the Atlantic, and emanated from the suggestion of a Corkman, Mr. James Beale, who was about that time a good deal occupied in steam-ship business, and was also President of the Cork School of Art and Science, and, I am glad to say, is worthily represented in our City to-day by his new phews, Messrs. Alfred and Henry Beale, of Adelaide Place, and also his grand-nephews, Messrs. Charles E. Beale, William Goff Beale and Alfred Beale Jnr . During a visit to London, and going to Blackwall in an omnibus in company with several gentlemen, one a banker and two members of the East India Company’s Board, the above speech of Dr. Lardner’s was discussed. In the course of the discussion he was referred to for his opinion, and he replied that not only was it practicable, but that if anyone would join him, he would guarantee to coal and send out a steamer from Cork, then built, to New York, and find a captain who should be competent to take her. He named Lieut. Richard Roberts, Royal Navy, of Passage West, father of the late Major R. Roberts, of River View, Glenbrook, Co. Cork, late 1st Batt. Norfolk Regiment, and also late Governor of H.M. Prison, Cork, who kindly placed at my disposal all the valuable and authentic records of the Sirius. Lieutenant Roberts was grandfather of Captain Richard E. Roberts, Royal Engineers, at present Recruiting Officer in Cork, and also of the late Lieut.-Colonel Ivon D’Esterre Roberts,Royal Field Artillery, who was killed in action June, 1915, at Gallipoli, Dardanelles, while in command of the 'Anson' Royal Naval Division. His project was agreed to, and he chartered the Sirius from the St. George Steam Packet Co. and Captain Roberts was appointed her captain. Thus we see beyond doubt that a Corkman originated the idea, a steamer registered in Ireland made the memorable voyage, and a Corkman navigated her to New York, which we see from time to time that the honour belongs to other ships and other ports. 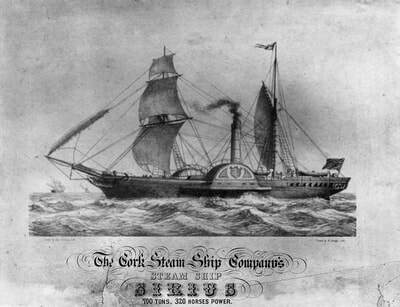 The Sirius was built in 1837 for the Saint George Company by Messrs. Robert Menzies & Son, of Leith, the machinery being supplied by Messrs. J. Wingate & Co. of Glasgow. Her cylinders were 60 inches in diameter, and the pistons had a stroke of six feet. She was fitted with Hall’s patent condensers, and used only freshwater in her boilers. She had two masts and one funnel, with a dog figurehead, holding between the forepaws a star, representing the dog star Sirius, after which she was named. She arrived in Cork 9th August, 1837, and cost 27,000, and was placed on the London line, under the command of Lieutenant Roger Langlands, R.N. The Sirius when fully loaded drew fifteen feet of water,the depth of the river at that time not being sufficient (during neap tides) to permit the vessel to take a full cargo on board, and the St. [Saint?] 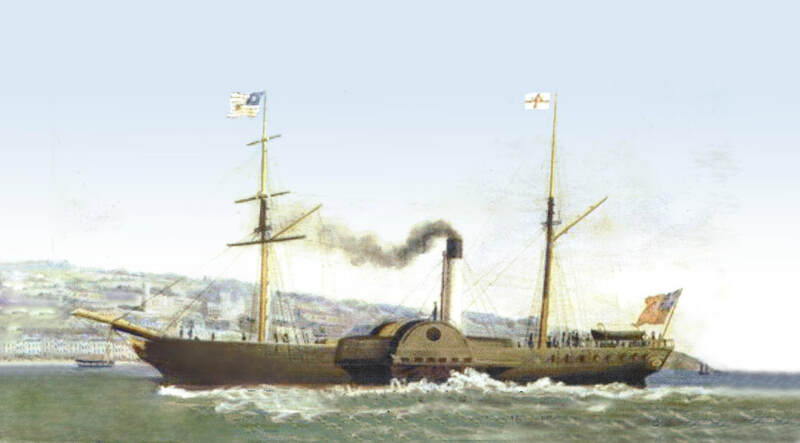 George Company had an iron lighter called the 'Kate' in which portion of the cargo was placed and towed to Horsehead by the Sirius, at which place it was transshipped into the latter vessel. On the 28th March, 1838, she hauled out of the London Dock,and sailed from the Eastlane Stairs under the command of Captain Roberts, and proceeded to Cork Harbour, steaming up to Passage Quay to embark her passengers for New York, and at 10 a.m. on the 4th April, 1838, Captain Roberts announced, byfiring a gun, that all was ready for starting. The Ocean, which arrived the day before with passengers for her, lay alongside, and the latter vessel sheered off, and both vessels got under way. As the Sirius passed down the river she was cheered loudly by the thousands of people who lined the shores, and the battery at Rocky Lodge, Monkstown (then the residence of Mr. John Galway), fired a salute. The Ocean with Mr. Joseph R. Pim, one of the Directors of the Saint George Co., Mr. James Beale, and Mr. George Laird, on board, proceeded to the harbour’s mouth. Then the two steamers saluted by dipping their flags, and the Sirius stood her course for the New World majestically, and was watched with keen interest until she finally disappeared on the waste of waters, between two continents, hitherto untracked from shore to shore by any steam vessel. This is to certify, that in pursuance of an Act passed in the fourth year of the reign of King William the Fourth,intituled [entitled? ], „An Act for the Resigtering of British Vessels,” Joseph Robinson Pim, of Oakfield, in the County of Chester; Paul Twigg, of Hartfield House, in the County of Dublin, and Jonathan Pim, of Bloomsbury, in said County of Dublin, merchants, having made and subscribed the declaration required by law, and having declared that they, together with William Heap Hutchinson, of Liverpool, in the County of Lancaster, merchants, being the five trustees duly elected and appointed, and the other persons or members associated as aJoint Stock Company by Deed of Trust bearing date 20thSeptember, 1833, in the name of The Saint George Steam Packet Company are sole owners (in proportions specified on the back here of) of the ship or vessel called the „Sirius,” of Dublin,which is of the burthen of four hundred and twelve tons, andwhereof Roger Langlands is master, and that the said ship orvessel was built in the year one thousand eight hundred and thirty-seven at Leith, as appears by the 1st July, 1837. AndWilliam Brown, Tide Surveyor, Port of Leith, having certified to us that the said ship or vessel has one deck and two masts,and that her length from the inner part of the main stem to the fore part of the stern post aloft is one hundred and seventy-eight feet four-tenths, her breadth in midships is twenty-five feet eight-tenths, her depth in hold at midshipsis eighteen feet three-tenths, that she is a schooner rigged,with a standing bowsprit; is square-sterned carvel built; hasmock quarter galleries, and dog figurehead; and that she is propelled by steam, with an engine room fifty-seven feet in length and two hundred and ninety-one tons; and the said subscribing owners having consented and agreed to the above description, and having caused sufficient security to be given, as required by law, the said ship or vessel called the„Sirius” has been duly registered at the port of Dublin. Certified under our hands, at the Custom House, in the saidport of Dublin, this eighth day of August in the year onethousand eight hundred and thirty-seven. Tonnage under 3rd and 4th William IV., cap.55, 450 44/94tons. Joseph Robinson Pim, Paul Twigg, Jonathan Pim, William Heap Hutchinson, and James Hutchinson, being the five trustees duly elected and appointed, and other persons or members associated as a Joint Stock Company by Deed of Trust dated 20th September, 1833, in the name of The Saint George Steam Packet Company. Number of sixty-fourth shares held by each owner-sixty-four -64. I hereby certify that the foregoing is a true copy of the Original Registry of the Ship „Sirius,” of the port of Dublin,Number 33, in 1837, as taken from the records now in my charge. HENRY N. MALAN, Registrar General. 4th April-From noon to midnight 85 knots; course W.N.W.[West-North-West? ]; light and clear weather. 5th April-135 knots, fresh breeze, and cloudy; head sea at noon; strong breeze; pressure on boiler 5 3/4lb. ; at midnight heavy sea. 6th April-Fresh gale, wind W. [West?] by N. [North? ]; 106knots; midnight, strong breeze and squally weather. 7th April-Storm and gale; passed a large ship steering to the eastward, under close-reefed topsails; ran 140 knots in the twenty-four hours; very high sea, split foresail. 8th April-85 knots, fresh breeze, head wind with rain; usedrosin with the ashes for the engines, as it made them burnbetter, and cleaned the chimney; wind N.W. [North-west?] by N.[North?]. 9th April-136 knots, fresh breeze, head wind; 4 p.m. gale,with heavy sea. 10th April-95 knots, fresh gale and squalls, rain and heavy head sea, wind W.S.W. [West-South-West? ]; spoke the ship„Star,” of New York. 11th April-165 knots, heavy gale and great swell, wind N.E. [North-east? ]; burned rosin with ashes and small coal. 12th April-190 knots, light wind and cloudy weather; 5lb.pressure, water in boiler quite fresh; hove for an hour to fasten floats and pack stffing boxes. 13th April-220 knots, wind variable from midnight to 3a.m. 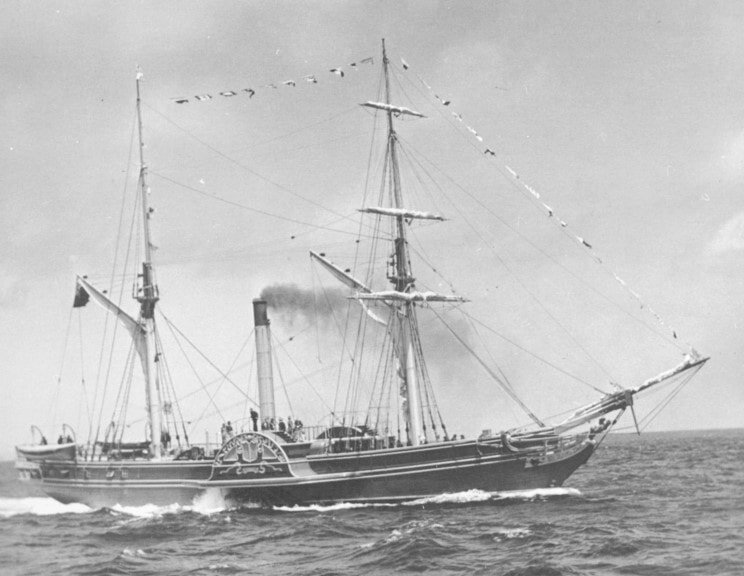 ; at 6 a.m. spoke the „Roger Sherman,” of Bath, under American colours, thirty-six days out from New Orleans, bound to Harve; at 7 a.m. hoisted colours to one of the Falmouth packets, bound to Halifax; three sail in sight. 14th April-200 knots, light breeze and cloudy weather, wind S. [South? ]; weighed one ton of coal, which burned one hour and fifteen minutes; lat. 44 3’, long. 42 9’; observed achange in the colour of water. 15th April-205 knots, mild and cloudy; one ton of coal burned in one hour and fifteen minutes; wind southerly, great quantity of birds insight; at 3 p.m. cloudy, with strong minutes; at 9 p.m. stopped engine quarter of an hour, owing to square sail flying to leeward; at 11 p.m. taken aback with fresh gale, very dark and foggy weather, shortened sail,thermometer fell ten degrees. 16th April-195 knots, fresh gale and sea heavy, with rain,sea rising at midnight; stopped engines for three-quarters of an hour to fasten screws of eccentric. 17th April-112 knots, heavy gale, with sleet and snow;pressure of steam 5lb. ; at noon, fresh gale, with heavy sea running. 18th April-126 knots, wind W.N.W. [West-North-West? ];strong breeze, with squalls; average of engine thermometer, 263/4. 19th April, 145 knots, burned a good deal of rosin, wind S.E. [South-east?]. 20th April-180 knots; in the morning wind S. [South? ], in the afternoon, W. [West? ]; violent rain; at ten minutes past one p.m. spoke H.M.S. [Her Majesty’s Ship?] „Cornwallis,”seventy-four guns, Captain Richard Grant, with the 11thRegiment for Bermuda; parted company 2 p.m.
21st April-195 knots, light wind and fair weather;exchanged signals with an American vessel. 22nd April-To 10 p.m. 267 knots, light breeze and fine weather; observed the high lands of Narranganest, at 8 p.m. slowed the engines; at 9 p.m. fired signals for pilot; then hove to for pilot, and anchored off the Battery at 10 p.m.(The eve of St. George’s Day.). Total knots, 2,897, averaging 161 knots per day; highest220, lowest 85. The total amount of coal consumed was 450 tons, and the engines made 15 revolutions per minute (The „Mauretania”consumes on a similar voyage 6,600 tons, equal to 22 trains of30 trucks, each containing 10 tons.). The Sirius started from Passage, port of Cork, on 3rd April at 10.30 a.m., in company with the Ocean, another splendid steamer of the Saint George Steam Packet Co. On leaving Passage, about seven miles below Cork,we were loudly cheered by the inhabitants, together with the most respectable families in Cork, who had assembled with warm hearts and handsome faces (the ladies I mean) to witness our departure and wish us success on our passage to our transatlantic brethren. Most of the gentlemen interested in our vessel proceeded with us as far as the Cove of Cork, where we stopped to let the Ocean come alongside to take the above gentlemen out, which having been done, with three hearty cheers and many heartier wishes, we gallantly bent our way for New York. We had now on board 450 tons coal, 20 tons water, and 58casks resin, besides an incalculable stock of other stores,all of which I beg to be understood (with the exception of 90tons of coal) was over and above what she was ever intended to carry as a dead weight, add to which her having 22 tons of water on deck, and you may form some conjecture as to her probable fate had she not been an admirable sea boat and in every respect qualified for the most dangerous weather, as well as her being one of the fastest boats out of London, in proof of which assertion I quote our unprecedented run from London to Cork in 50 hours and 30 minutes, a distance of 650or 660 miles, but as we started from off the Nore, say 600, which will give an average of twelve knots an hour. Our jibboom was out the whole of the passage, and only on one occasion did we house our topmasts, yet, strange to say,she has not strained a rope-yarn. I beg to say that the Sirius is to be followed by the British Queen, as noble a piece a naval architecture as ever floated on the bosom of Neptune’s watery domain. The said vessel is about 1,834 tons, and will be of 500 horse power. The engines alone will cost 30,000, and I should say altogether her cost will not fall short of 120,000 when ready for sea. This as it deserves to do, is the prayer of a sincere well-wisher to the British and American SteamNavigation Co. It really appeared to me as if Providence smiled propitiously on our voyage, as we passed through, or, I may say, under, as it appeared to us, on the three last days of our voyage, three of the most splendid arches (I may say triumphal) I have ever witnessed, extending from north to south about six miles, the centre hanging immediately over our tracks, the sun going down clear resplendent. The dark, thick clouds hanging in our rear like an impenetrable mass, tingedalong the margin by other clouds of a snowy whiteness, formeda most beautiful sight, such as the mind of man cannot truly imagine unless he had previously seen it. LIEUT. [Lieutenant?] RICHARD ROBERTS, R.N. [Royal Navy? ], Captain. G. T. BRIGGS, R.N. [Royal Navy? ], Second Officer. F. A. WHITTAKER, H.C.M., R.N. [Royal Navy? ], Third Officer. She carried 40 passengers, viz., first cabin, 5 ladies, 6gentlemen; second cabin, 5 ladies, 3 gentlemen; steerage, 1lady, 20 gentlemen. Total passengers, 11 ladies, 29gentlemen. The only surviving passenger is the Rev. T. Ransome, Rector of Compton Bassett, Wilts, who, when four years old, crossed the Atlantic on this memorable voyage,together with his father (who was proceeding to quell the Lower Canada Rebellion), sister, and brother. Mr. Davenport and his daughter, actor and actress, were also amongst the passengers. The saloon fare was 35 guineas (the same as the sailing ships); second cabin, 20 guineas; and steerage, 8guineas. THE SIRIUS! THE SIRIUS! THE SIRIUS! 'Nothing is talked of in New York but about this „Sirius.”She is the first steam vessel that has arrived here from England, and a glorious boat she is. Every merchant in New York went on board her yesterday. Lieut. [Lieutenant? ]Roberts, R.N. [Royal Navy? ], is the first man that ever navigated a steamship from Europe to America'. 'The Mayor of the City, the Boards of Aldermen and assistants, according top previous announcements, embarked yesterday afternoon about half-past one o’clock in barges,escorted by a fleet of other barges belonging to the Navy Yard, under the direction of Capt. [Captain?] Stringer of the Navy, all bearing the American flag, and arranged in beautiful order in the river, making one of the most delightful pictures ever seen from the city. About the same time a large number of citizens, some two or three hundred invited guests, put off from the North River, all for the purpose of doing honour to the steamship ‚Sirius,’ her captain and crew, and for celebrating the great event in our harbour. The ‚Sirius’ was dressed out in flags and pennants, the United States’ Flag being on one mast and the British flag on the other. The band on board the Sirius played 'Hail Columbia.’ After the Corporation and several of the officers of the army and navy were put on board the sides and from all parties, the guests were admitted, and immediately the cabin, as well as the quarter deck, were thronged by the crowd who had assembled fort he occasion. 'The gallant Commander, Captain Roberts, was seated at the table in the cabin, with the Mayor on his right and Alderman Hoxie, the Chairman of the Corporation Committee appointed on the occasion, on his left. Capt. Hoskin, of the Great Western’ (Arrived the day after the „Sirius,” viz., 2p.m., 23rd April, 1838.) the British Consul, and several other gentlemen being at the table. The cabin of the ‚Sirius’ was by no means fitted for such a welcome as the Corporation of the City wished to give Capt. Roberts, nor for such a welcome as the Captain wished to his honoured guests, but the cheer was abundant on the heavily-laden table, and the wines soon made the compact crowd so happy that they forgot the pressure to which they were subjected. All tongues were soon in motion in commemoration of the great event'. 'Alderman Hoxie, after calling for order, congratulated Captain Roberts on his safe arrival here, and in the name of the great city of the New World, welcomed the gallant adventurer from the Old. What was a matter of experiment, here marked, it was reserved for the great good fortune and for the high fame of the gallant Captain to prove to be a fact. Though another had the honour of discovering the New World,yet that New World for centuries had been approached only by canvas filled with the varying winds; or if otherwise, but cautiously and timidly by some trembling steamer whose arrival and departure had not been a matter of great note. Yet certainly to the Sirius, to her gallant Commander and gallant crew, was reserved the fame of first shooting boldly from Europe over the broad Atlantic in defiance of winds and waves, and in first bringing into our city the flag of Great Britain up borne on the masts of a steamship, to wave side by side with the Stars and Stripes of our states. The Hudson River surely had never before seen such a sight. Here was a steamship from England, and there were steamboats from Albany and Providence and New Haven. 'All this was said with so much sailor enthusiasm and hearty goodwill, that it was one of the most eloquent speeches ever heard. The applause from all sides was most hearty. 'His Honour the Mayor then rose and electrified the whole assembly with a brief and very eloquent address, but of little of which we have room to report. Amongst his observations here marked to the Captain that this favoured and enterprising city hailed his successful effort with great joy. ‚We feel,’said he, ‚a deep interest in your success, and this is fully proved by the many anxious and enthusiastic Americans who greet you on this occasion. We welcome you to our country with all our hearts. As you are a stranger amongst us, allow me to tell you that here you will find a people proud to congratulate you on your noble triumph. The memory of Fultonis dear to the country, and were he now present he would rejoice to join with us to do honour to the authors of this splendid achievement. The far-sighted mind of that illustrious man fondly anticipated this very hour-this hour when two mighty continents would be brought near to each othrby the magic power of steam, and when the war of the elements would cease to interpose invincible obstacles to speedy intercommunication. We do not envy your prosperity-we glory in it, and we emulate it. The genius of our citizens is adequate to any purpose, and their industry and perseverance are commensurate with the unlimited means of accomplishment. Although we received from Old England early and useful information upon the application of steam, we soon extended the value of her discoveries, and she in turn has continued to astonish the world by new developments. We are nowbanquetting within the last of the wonders that has crowned her labours. Although we yield not to any nation the palm of exclusive renown upon this subject, we do not hesitate to give you that high meed of praise so justly your due. On behalf of our favourite metropolis, we bid you welcome, thrice welcome,to New York. You offer to us a new course of prosperity, and be well assured that whatever you leave the green hills and the white cliffs of Britain for the fertile and romantic shores of this vast Republic, you come to a land and a nation that knows how to appreciate your work-to one where your person and your rights, in common with our own, will be acknowledged and protected-and to a people whose hospitality,whose sympathy, whose love of justice and respect for the laws, is surpassed by none other. Though you have for the first time crossed the broad sea as an explorer in a new way,yet you have found a great nation already in being, of the same stock as your own, with the same language you left at home, and a people of true English hospitality, who will be happy to encourage you to repeat your visit as often as you please. Indeed, sir, it is enough merit the just compliment we all pay when we say you have elevated the high character of England and given hope of new and higher destiny to America'. The Sirius sailed from New York on the homeward voyage on the 1st May, and on her departure thousands of people assembled on the wharves to wish her a prosperous passage, the Battery saluting with 17 guns, a mark of respect seldom or never before to any merchant vessel. She arrived at Falmouth at 8 p.m. on the 18th May, after a boisterous passage, the prevailing winds being S.E.[South-east?] to N.E. [North-east? ], and proceeded to London same day, where she duly arrived all well. The following were her daily performances in miles:-153,193, 155, 90, 106, 131, 158, 180, 225, 220, 176, 156, 172,181, 200, 227, and 199 to Scilly. On the 16th she spoke the Tyrian sailing packet, for Halifax, and brought in her mails to Falmouth. 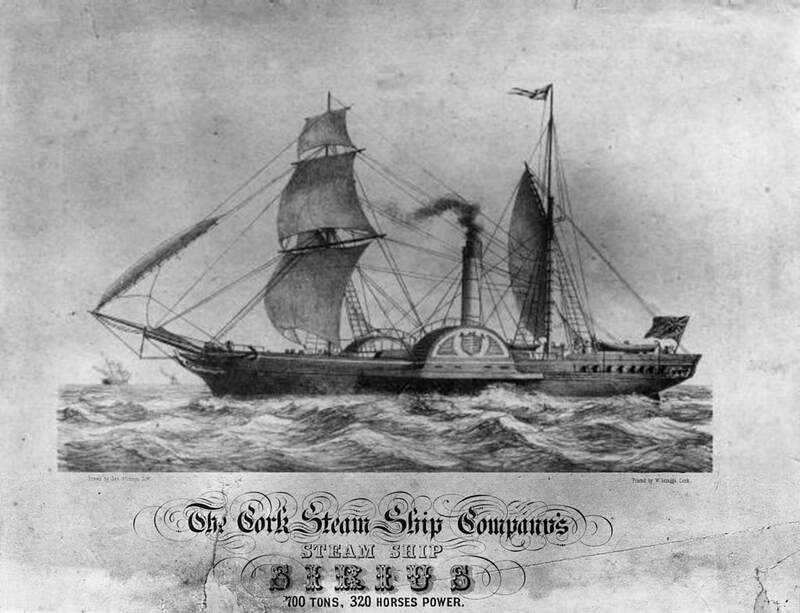 'Steam Ship ‚Sirius,’May 19th, 1838. The undersigned passengers in the steamer ‚Sirius,’ from New York to London, beg leave, before parting, to express their sense of the merits and high capabilities of Lieutenant Roberts, R.N. Commander, during the first voyage by steam ever made across the Atlantic. The estimation of his gentlemanly attentions, skill, and seamanship is enhanced from the fact of experiencing nearly a succession of contrary winds during the whole passage, with the slight exception of a few days. In the present infant state of Atlantic steam navigation the undersigned cannot forbear expressing their decided conviction of its security and speed, far outstripping anymore of conveyance hitherto known, and from the facts coming within their knowledge, they have no doubt of the complete solution of the problem hitherto propounded respecting the practicability of Atlantic steam navigation. On his return to Cork Captain Roberts wrote to his agents in New York, advising them of his successful voyage home, and that he expected to arrive again at New York about September in the British Queen (to which steamer he was just appointed), and stated she was the most handsome manner by the citizens of Cork, who were about to present him with a service of silver value 200, the Corporation with an address and freedom of the city, in a silver box, and the town of Passage (where he was living) a large salver. In due course the presentation was made, the arms of the city being elegantly engraved on the box Lieutenant Roberts was also presented with the Freedom of the City of London in a gold casket, which unfortunately was lost with him in the 'President'. 'The casket measures 4 inches in length and two-three-quarters inches wide. It is of English manufacture,with the town mark, and forms a projecting rim for the City Arms and civic emblems which are engraved upon it. These latter are the Maces, Sword and Oar. The treatment of the Arms is unusual; the ship, instead of entering the harbour, is shown outward bound, and has the house flag of the old St. George Company floating from her stern. The underneath part of the box is engine turned, and the sides,which swell towards the base, are richly chased in high relief with clusters of flowers and roses. The inside is fire gilt,and has the following inscription engraved on the cover:- ‚Presented by the Corporation of Cork, with a certificate of the grant of the freedom of that City, to Lieutenant Roberts, R.N. , Commander of the Sirius, in the accomplishment of the first voyage made by a steampacket from the European coast to the American coast. John Bagnell, Mayor. Robert Vincent and George Forster Sadlier, Sheriffs. This was probably the last box presented by the old Corporation, as they ceased to exist in 1842. 'The address is surrounded by an elaborate and richarabesque border of scrolls interwined, and corners ornamented by shells and dolphin. The headpiece contains the City Arms,with the very appropriate motto Statio Bene Fida Carinis. The effect is heightened by irradiations in all directions, as from a central point. With the city arms blended the municipal regalia, consisting of fasces, collar of SS, maces with imperial crown, the sword of Justice, silver oar, and other symbols of civil government. The tail piece is designed to illustrate the address. In the centre (on a rugged rock)sits old Ocean, in an appropriate attitude, with a venerable beard, his hair entwined with sea weeds, reclining on a water urn, and holding a classic helm. On the right of the figure are allegorical emblems of the United Kingdom, the Imperial Arms on a shield, the Union Jack, harp, etc., with appropriate representations of Trade, Manufacture, and Commerce, such assailing vessels and steamers, bale of merchandise [merchandise? ], etc. On the other side, separated by Ocean from the figures which represent England, an emblem of the United States, the Eagle with the Arms of America with a shield on its breast, the Vine, indicative of the timber trade, and various objects having reference to American commerce, under the national flag of that enterprising people. In the centre of the lower border are introduced the arms, crest and motto of Lieutenant Roberts. The address is signed by the Town Clerk, J. C. Besnard, under whose direction it was executed, and is sealed with the ancient Corporate seal. Although the address presents the appearance of a very beautiful line engraving, the entire was executed with a common pen and ink by an ingenious artist of this city, Mr.James McDaniel. He was a gifted musician, a clever caricaturist, and excellent pen and ink artist. His son Daniel was a portrait painter on the Parade. Shortly after he settled in London, and died there of fever.